Low Observables (LO) or Stealth is the most important paradigm in air warfare since the invention of the jet engine. Stealth technology aims to reduce the radar signature and infrared signature of an aircraft to the point, where detection ranges by hostile sensors and weapons are so small, as to render them tactically ineffective. The increasing capabilities of guided missiles and airborne radar during the late sixties and early seventies reached the level where the established methods of defence penetration, based upon a combination of manoeuvre and jamming, became increasingly less effective. The wide proliferation of pulse Doppler radar and IRS&T equipment, and improvements in missile performance and seeker technology, produced a situation manoeuvre and low altitude flight could not prevent engagements from being initiated, especially against bombers. The increasing sophistication of radar and seeker technology caused significant and growing costs in electronic countermeasure (ECM or jammer) equipment, and the increasing tempo of warfare meant that time would not be available to adapt existing in service ECM equipment to hitherto unknown threat systems, before unacceptable combat losses were incurred. Both manoeuvre and jamming are techniques which defeat specific weaknesses of an opponent's sensors and weapons. Without knowledge of these weaknesses, apriori, gained for instance through human intelligence operations, signals and electronic intelligence, or capture of an opponent's equipment, it is extremely difficult and often impossible to develop particularly effective countermeasures. The central philosophy behind Stealth is to defeat the basic physics underlying the opponent's sensors and weapons. By reducing the signatures of an aircraft down to an extremely low level, an opponent's sensor and weapons technology is denied any information about the aircraft. Very faint and fluctuating signatures will be extremely difficult to detect until the aircraft is very close to the threat system, and will also be extremely difficult to track successfully. A typical missile engagement requires that the aircraft be detected, tracked, its flightpath predicted, and missiles launched and guided to impact for the engagement to be successful. Should any of these phases of the engagement be disrupted or defeated successfully, the engagement will not be successful. Extremely short detection ranges produce the further advantage of compressing the time available for the opponent and his automated equipment to react, thereby increasing the chances of the equipment not performing, or the operators making mistakes. Stealth restores the element of surprise at a tactical, operational and strategic level, and will place an opponent in a situation not unlike that which predated the invention of radar. Stealth techniques are technologically demanding, since they require that designers address the necessary constraints inherent in signature reduction first and foremost, requiring significantly more complex tradeoffs in other areas of a design. At this time only two operational types, the F-117A and B-2A, employ genuine stealth technology. The USAF's F-22A Raptor will be the next production aircraft to employ genuine stealth technology, which is also to be incorporated into the planned Joint Strike Fighter. 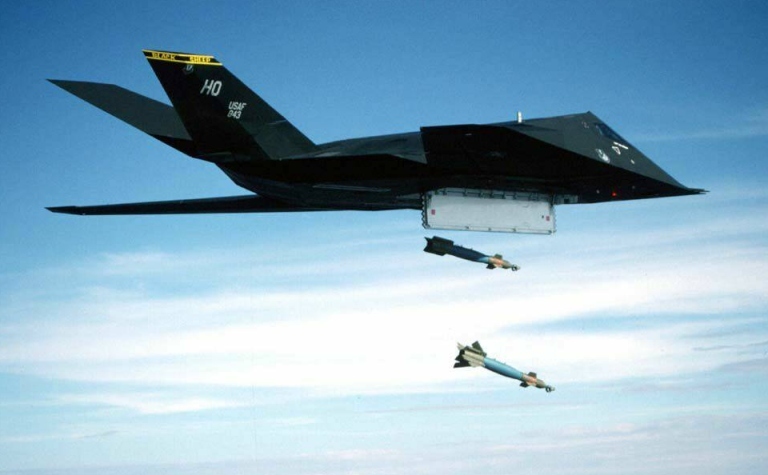 The established penetration technique for strike aircraft, pioneered by the F-111 design, involves flying into defended airspace at very low altitudes and high speeds, and defeating hostile radar and weapon guidance by using jammers. For this purpose, conventional strike aircraft are equipped with Terrain Following or Avoidance Radars (TFR or TAR), thermal imagers, and typically comprehensive packages of radar warning and jamming equipment. In a situation where the opponent lacks pulse Doppler technology capable of detecting low flying targets, and uses relatively simple and unsophisticated radar and missile guidance equipment, low level defence penetration can be very effective. Until recent times this has been true of the broader region, and thus the RAAF's F/RF-111C/G has been an effective penetrator. Low level penetration, while tactically effective in relatively benign threat environments, has some important limitations. The first is that it incurs a significant penalty in combat radius, since turbojet and turbofan Specific Fuel Consumption is poor at low altitudes, and the higher air density requires higher thrusts be employed to achieve tactically useful airspeeds. Moreover, continuous manoeuvres to clear terrain impose a significant fatigue load on the airframe, and the aircrew, thus limiting airframe life and aircrew endurance in combat. 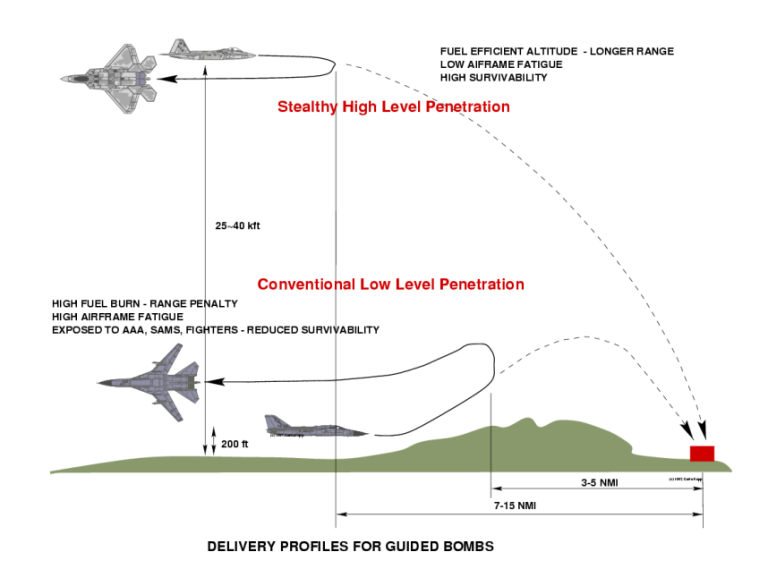 Often much effort is required in mission planning to select the lowest risk ingress and egress routes, and in some instances supporting aircraft armed with anti-radiation missiles may be required, as well as fighter escorts. This technique is termed "Strike Packaging", and was pioneered during the Vietnam War. Its primary drawback is the costs incurred per damage inflicted, since the supporting assets typically outnumber the bombers. At low and very low levels, aircraft will be exposed to fire from a wide range of weapons, including small arms, AAA, short range point defence SAMs, and Man Portable SAMs (MANPADS), collectively termed "trash fire". While not particularly effective on a per-firing basis, large numbers of firings will often yield a statistically significant outcome and aircraft will be lost, as happened with RAF Tornadoes during the early phase of the 1991 air war. In more recent times, the proliferation of pulse Doppler technology in air defence radars, medium and long range area defence SAM seekers, fighter radars and AAM seekers has significantly reduced the survivability of aircraft using low level penetration techniques. The strategy recently adopted by users of conventional low level penetration aircraft to defeat such defences has been the adoption of standoff missiles and glide weapons, which may be launched from outside the effective range of the target's defences. This technique can often be highly effective, but incurs a major cost penalty since standoff weapons are typically 10 to 50 times more expensive than guided bombs. Moreover, fighter aircraft can often engage bombers at ranges of hundreds of miles from the intended target. Defeating fighters requires standoff weapons such as medium and long range cruise missiles, which can be launched from safe distances. Such weapons are mostly very expensive, with costs in excess of a million dollars per round, and carry relatively small warheads. Unless the conflict is very short, stocks of weapons may be expended before the desired military effect is achieved. It is worth reiterating that cruise missiles and standoff missiles most often carry warheads of weights between 500 lb and 1000 lb. With the exception of the UK's Royal Ordnance BROACH warhead, most such munitions have a limited ability to defeat thick reinforced concrete structures such as bunkers and Hardened Aircraft Shelters. It is worth noting the large numbers of Tomahawk cruise missiles typically expended by the US in strikes against Iraq or more recently, in Bosnia. It is often necessary to target 4-8 rounds to achieve the same damage effects as produced by a pair of cheap guided bombs. The use of Stealth techniques avoids most of these difficulties. A stealth aircraft may penetrate at a high subsonic or low supersonic speed at medium or high altitudes, thus achieving the best possible fuel efficiency and combat radius for the airframe, while incurring minimal airframe and aircrew fatigue. Mission planning is much simplified, since terrain is no longer a factor. The target may be attacked with relatively cheap guided bombs, which provide very high lethality even against hardened targets. This will translate into a lesser number of sorties required to achieve the desired military effect, since the lethality per sortie is much increased. 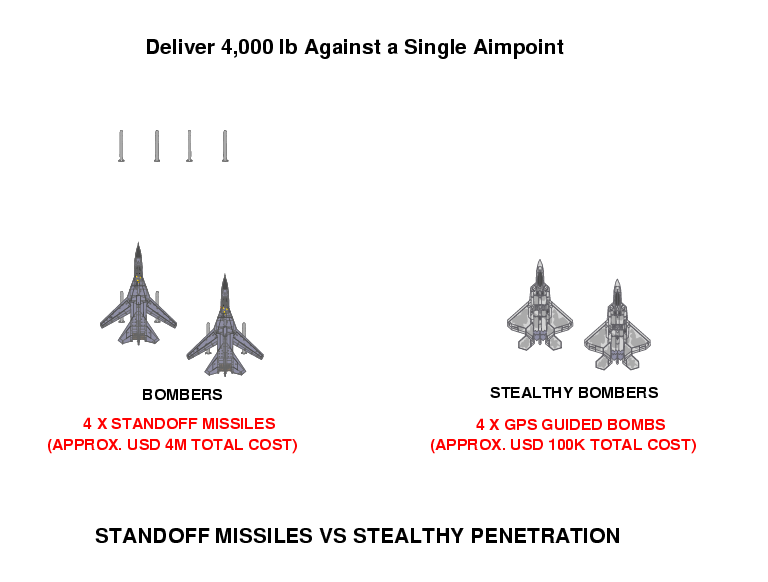 In terms of "bang per buck", Stealthy penetration is significantly cheaper than either strike packaging or using standoff weapons. This is most apparent in a sustained combat situation. 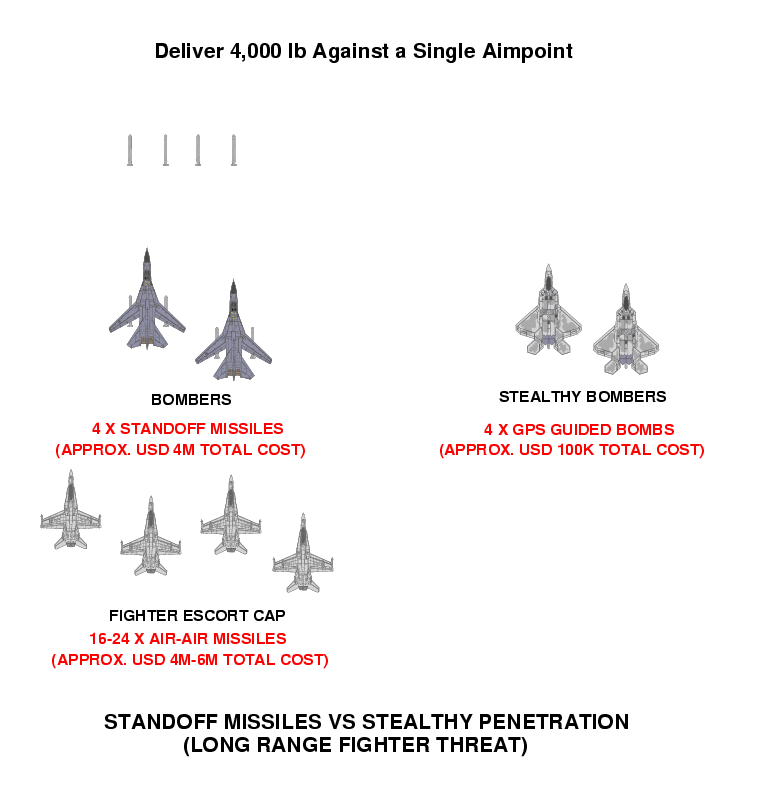 If we make the arguably optimistic assumption that adequate standoff missile stocks are available for the duration of the conflict, we find that the USD 70-100M cost of a stealthy strike aircraft is equal to the cost of the standoff missiles expended after a mere 35-50 strike sorties flown against defended airspace. If we assume a turnaround time of 2 hours per sortie, and a sortie duration of 4 hours, i.e. 4 sorties per day, then the cost of the stealthy strike aircraft is amortised in 9-12.5 days of sustained combat operations. For higher sortie rates at shorter ranges, this amortization rate is even higher. The case is even stronger should we consider using strike packaging rather than standoff weapons. The issue of war stocks of expensive standoff weapons, and the replenishment rate of these by production is problematic. Since production rates for such munitions are modest, due to their complexity, in a conflict what stocks are available will more than likely have to last the duration of the conflict. Once stocks are expended operations must fall back on strike packaging, further increasing costs. Where a fighter threat exists, we must also budget the costs of the AAMs expended and the costs of mounting fighter sorties to defend the standoff missile shooters. If we are operating beyond the CAP radius of the fighter, then the cost of tanker sorties must be included. Therefore, shooting standoff missiles may not confer a significant cost advantage unless the duration of the conflict can be guaranteed to be shorter than about one week. Recent historical experience suggests that conflict durations are typically of several weeks, therefore the argument for the use of either strike packaging or standoff missiles is not sustainable, unless the opponent's air defence capabilities can be defeated very quickly. A scenario of regional relevance would be such, where the RAAF is attempting to shut down several airfields, defended by fighters and SAMs. Given that an airfield basing one or two squadrons of aircraft will have a dozen or more critical aimpoints, and will most likely need to be reattacked to keep runways and taxiways closed, it is unlikely that the RAAF, or any air force of similar modest size, will be able to sortie enough aircraft to achieve a knock-out blow in the first few days. Therefore the opponent's air capability will have to be reduced by repeated strikes over a one or two week period until rendered operationally ineffective. As a result, the expectation that air superiority can be achieved quickly and decisively is somewhat optimistic. 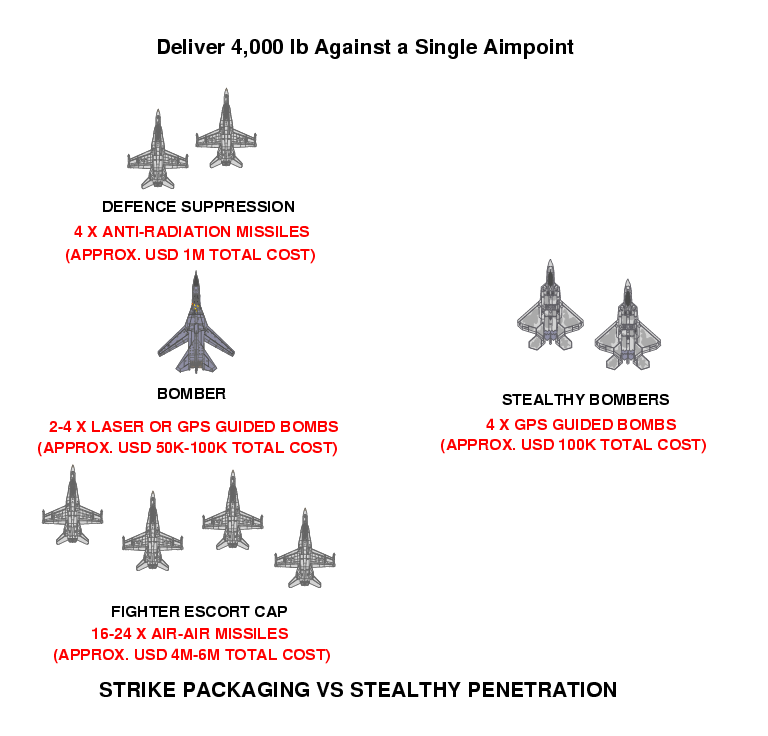 Under such conditions, the cost advantages of stealthy strike over strike packaging or escorted standoff missile attacks are truly compelling.